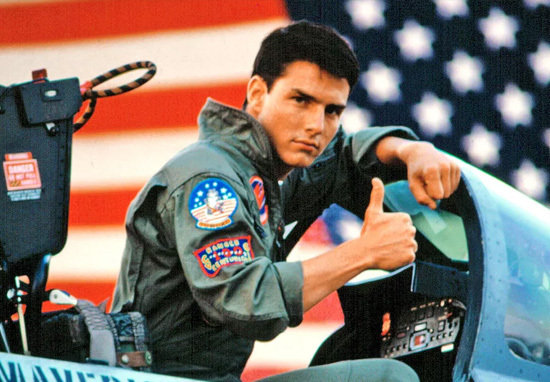 As the oldest member of the UNILAD staff at the ripe old age of 34 it gives me great pleasure to write about how Tom Cruise has barely aged a day since the original Top Gun was filmed in 1985 because by my maths I’m going to be looking pretty dapper well into my 60s. Tom Cruise will be flying into cinemas with a supersonic boom in the highly-anticipated Top Gun: Maverick in summer 2020 and pics from the sequel’s set show he doesn’t look much older than when he first attended the Naval Air school. Now decades later Cruise is back on set to reprise his role of Lt Pete ‘Maverick’ Mitchell, now an instructor at the Naval Air Station Mirramar in San Diego, California. He’s been spotted riding a superbike, a limited edition Kawasaki Ninja H2 Carbon, and wearing the aforementioned bomber jacket and aviators, which will presumably never go out of style in the military fashion scene. Maverick’s bike is reportedly one of only 120 ever produced, costs $30,000 and features a 1000cc four-cylinder with 200bhp and a top speed of 209mph, MEAWW reports. Alongside Cruise, Val Kilmer will be returning to the base as Lt Tom ‘Iceman’ Kazansky, and Miles Teller, Glen Powell, Jennifer Connelly, Jon Hamm, and Ed Harris have been announced as cast members. The son of Radar Intercept Officer LTJG Nick ‘Goose’ Bradshaw (taken too soon) will play a part in the sequel although details of who will play him have not been released as yet. Now, where did I put my aviators?